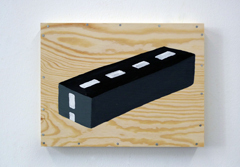 The exhibition “Traffic” in the Feature Room at Galerie m presents brand new works by Berlin-based artist Antje Dorn (b. 1964, Aachen) that revolve around the motif of the road with all its different directions and turns. 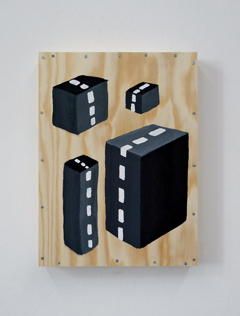 The artist has made her own wooden panels, onto which she paints blocks in dark gouache. As physical objects in space, these works would at first appear to have little in common with roads. It is only the deep gray shades of the blocks and their white markings that suggest the corresponding associations. Sometimes a single block is painted onto a panel, and in other cases we see larger groups of “cubed roads,” their markings always following their own inner logic. The blocks’ perspectival volume creates the illusion of three-dimensional formations. Dorn has deliberately left the natural wood ground unpainted. The pale wood grain thus contrasts not only in color but also in its surface qualities with the dark asphalt of the road bodies, which thus stand out all the more clearly from the background, appearing to float despite their massiveness. The aesthetic of the native two-dimensional ground versus the clearly contoured street structures in space is reminiscent of the style of comics, just like Dorn’s series “Bauten” (Buildings, 2014). In terms of content, the artist revisits with “Traffic” the theme of her 2016/17 series “Passage.” However, while the latter focused on how in today’s street scene people pass by one another without connecting, each lost in his or her own little world, the road is now pushed to the fore as a linking and mediating element. At the same time, the sheer endlessness of these roads evokes the ceaseless movement and bustle of the city.